A digital cenotaph, this is the best place online to remember and honour the Canadian soldiers that have died during Canada’s Mission in Afghanistan. Each fallen hero is presented in some detail, and eulogized as he is laid to rest. But this respectful Canadian blogspot is also filled with pictures of the living. In some stories there are images of children in Afghan farm villages, and civilians herding livestock alongside military vehicles – the blog communicates a subtle understanding of life in and around Kandahar, from the sombre perspective of funerary anecdotes. Canadian Heroes is authored by a volunteer committee of news media writers. It shares some some connection with CTV. Paul, the primary contributor, seems very knowledgeable about the overall mission, and in some cases he describes the people he’s met, and the places he’s seen first hand. The tone is always courteous, and the text is void of any opinions or political debate. The comment function has been disabled. 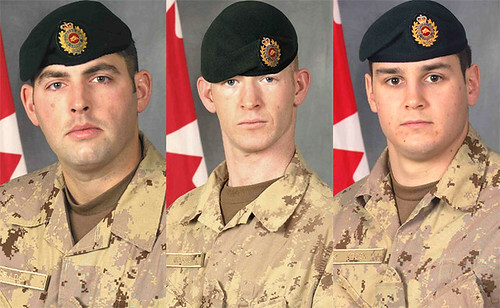 Canadian Heroes is a respectful flagpost on the Internet; it’s an information rich reminder that Canada is at war, and young Canadians are sacrificing their lives to help make Afghanistan safe for the men, women and children who live there. Certainly a worthy mention on your featured blogs, regardless how we may feel about sending our young people to Afghanistan they should be honoured and this blog is doing its bit. Thanks for featuring it, we can sometimes be distanced from the whole thing by just watching the news.